The Dixie Moon Saloon is pleased to be a part of the St. Practice Day Pub Crawl! Deck yourself out in green and join in on the fun Saturday, March 9 in downtown Royal Oak. Participating locations include Mr. B’s, The Rock on 3rd, Fifth Avenue, Tequila Blue, Royal Oak Taphouse, Hamlin Corner, Pronto!, Mesa, HopCat, Jolly Pumpkin, and … best of all … The Dixie Moon Saloon! 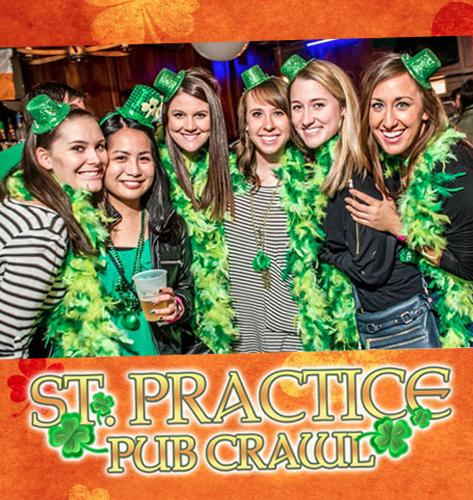 Your $20 cover includes St. Patrick’s Day-themed swag, a lanyard for $3, $4, and $5 drink specials, a keepsake photo station, ShamROCK Karaoke, photos with the leprechaun, and more! Visit www.St.PracticePubCrawl.com for more information and to reserve tickets.